I think it is very wise for Prosper to encourage the students to pick something they love to market. I love ballroom dancing and I guess there is a gene in most women that makes them love shoes. Because of Melissa’s decision to do something she loved to do, she has seen amazing results with her first website. As many of my readers know, my first website was all about clogging shoes and the clogging dance industry. I was such a wild little kid that my mom did everything she could to calm me down. She put me in every sport, piano lessons, singing and finally, after exhausting all other options, clogging was an attempt to drain me of unnecessary energy. At the time I don’t know how much I really liked it, but, it’s paid off now in more ways than I ever imagined. Clogging is really why I’m now so actively involved in the search engine optimization and on-line marketing industry. Without that first website idea, I would not be doing what I do today. So why is it important to do something you love to do? As I mentioned in a previous post, starting an on-line business isn’t easy. You have to be patient, diligent, hard working and persistent. Luckily I had a mentor that took me by the hand and walked me through some of his trials and errors (although he wouldn’t claim he had too many 🙂 ) so I didn’t have to go through them on my own. He didn’t tell me what industry I should get involved in to start, but he did have me write down hobbies, interests, and things I enjoyed doing. As I look back at my education, this was one of the first steps towards my success. If you are just getting started with an on-line business or thinking about starting something new, this is my biggest recommendation – Do Something You Love to Do! Many people have a tendency to think, “What will make me the most money?” or “What’s the best selling thing out there – I’ll do that.” I’m yet to see a mindset like this become really successful. Yes it’s important to do market research. Just because I love to watch sports on TV doesn’t mean that activity is going to make me money. But as you consider different options, don’t rule some out just because you “think” they wouldn’t be profitable or you “think” they are too saturated with competitors. In Part 2 of this post I plan to do a case study on a client that has really seen success with her first on-line business because she followed this simple concept – she picked something she loved to do and then monetized it. 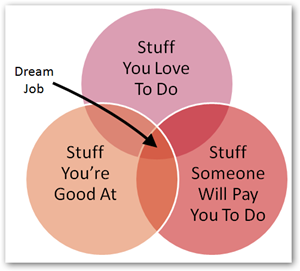 This is great–love the illustration with the overlapping circles that really narrows down what your ‘dream job’ is. I’m so glad you encouraged me to focus on something I really loved. Once I eliminated all the things I was trying because I thought they sounded easy and quick, or fast money-makers, and concentrated on something I really loved and am good at–well, I won’t say it was easy or fast, but it’s going well now and in fact I was just looking over price lists and thinking about a couple of new suppliers. Great to hear from you! You are a perfect example of someone that is doing what they love to do and, low and behold, you’re power seller on ebay because of it! Thanks for the comment – I hope to talk to you soon. Trials? What are trials? I never heard of them!! LOL – Thanks Nate! You are my biggest trial Silt! I took your advice and posted a “Comment Contest” on my website. I received some great giveaways from TV studios this week and I offered them up to all of my readers! In the first hour I received 20 comments! Pretty good social networking tactic! What’s been happening Mark? I see you on TV stuff – how’s business? We should talk again soon – I’m still game for an interview or something. Granted, the idea is a bit different than what you are doing, but the concept is similar – they are probably making money by referring people to different specials, hopefully on high ticket items. My business started with doing something I loved. So many people loved my product and asked for more. I never intended to sell it. But, hey, I loved to make them, they made me happy and people love to buy them. You’re one of the best examples of someone who is doing what they love to do and making money at the same time. When you approach a business that way, the speed bumps become fun to find ways around instead of barriers that cause you to quit or give up! I look forward to talking soon. Enjoy your vacation! We are trying to build a website but having trouble. We finally found the niche we love even though we had so much trouble to start with. We will keep trying. It’s coming right along Jesse! I know you can do it and am happy we finally got the merchant account stuff fixed today. Keep up the good work and keep asking questions – it’s the best way to learn! Great quote Kaly. This is so true – if you don’t love what you’re doing, do something else! Every person I’ve worked with or interviewed has this common characteristic – they are doing what they love to do. Their business is their lifestyle, not a JOB (just over broke). Makes sense. I’m a believer! The first step in a successful business is belief that you can succeed! One of my favorite proverbs – (Prov 4:7) Wisdom is the principal thing; therefore get wisdom: and with all thy getting get understanding. The point you make fits this proverb well. Sometimes we too quickly seek the wisdom that is outside ourself. If we find the wisdom of honest self-analysis the pathway to the outside world of wisdom will be sufficiently narrowed where we will be able to find the knowledge that matches the person we are inside. I’ve always thought that there are as many different kinds of people as there are animals; only all people look alike. The KEY is to really know WHAT (WHO) WE ARE. If we’re not a lion – no use trying to be the king of the forest!! Nate, I am following the instructions and things are coming together — new beginnings are challenging — and I do like challenges – where I learn and grow and end up beyond where I began — soooooo — this is success yes? And $$ is a part of it, yes! Yes that verse is very key – Get wisdom AND with all the getting of wisdom – GET THE UNDERSTANDING necessary to be successful – Oh Yea!!! This is what came to me as I looked at the graphic. Thanks! in balloons of course – Ha! I am so glad that this part of the process is already done for me. Our business is well established in a brick and mortar store. We totally love what we do. Now I feel like we can really crank it up and take aspects of what we make and market it online. My website now offers too many things. I look forward to really focusing in on what will work online! THX that’s a great aneswr!